Designed for 3D and VR! Whether you’re working on a major feature film, an epic game, a virtual reality project, or a combination of all three, Fusion has been designed as a true 3D application from the ground up. You get a full 360º 3D workspace, along with the ability to import models and scenes from software such as Maya, 3ds Max and Cinema 4D. 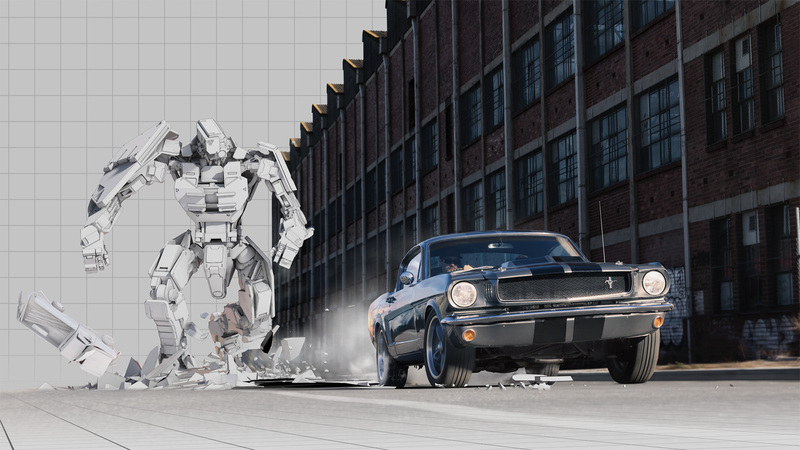 That means you can composite, light, and render 3D objects and scenes from other software, all inside of Fusion! No other effects or motion graphics software can do that! With Fusion, you have full control over re-lighting, volumetric effects and image processing so you can save time and be more creative, all without having to render in multiple applications! The powerful infinite 3D workspace in Fusion is OpenGL accelerated so you can interactively modify millions of polygons, deep volumetric atmospherics, and 3D particles systems without having to wait! You can view previews instantly, and final renders are done in seconds instead of hours! Fusion 9 is a massive leap forward in VR! You get a full 360º panoramic workspace that is completely interactive. You can use the built in panoramic viewer or wear popular VR headsets such as Oculus Rift and HTC Vive. GPU acceleration makes it extremely fast so you can wear a headset and interact with elements in your VR scene in realtime! Plus, the new 360º spherical camera renders out complete scenes, all in a single pass and without the need for complex camera rigs! Fusion lets you spend less time recreating the work you did in other apps like Maya and 3ds Max, and more time moving projects forward! You can import cameras, load FBX scenes or take advantage of the Alembic format for animated geometry. That means you can import a 3D virtual set extension, composite it, light it, and render it all in the same software! Fusion lets you quickly create your own 3D objects using the built in drawing tools and primitives! There’s even a library of basic objects and shapes, so you can get started quickly. If you type text or import a vector illustration, you can instantly extrude it into 3D space, define the object’s edge bevel, material, texture, shading, reflection and more! In order to create believable 3D scenes you need sophisticated lighting tools. Fusion lets you add unlimited, customizable light sources and control how elements within the shot react to lighting so you can set up incredibly detailed 3D sets! Control ambient, directional and point lights, or cast shadows over 3D geometry using the spot light! Fusion uses advanced optical flow tools to correct the intricate alignment and disparity issues that can occur during 3D production. Fusion simplifies stereoscopic workflows by using a single camera and can even create 3D from 2D source material. That’s why Fusion is used by more studios than any other solution to convert 2D movies into 3D! When you render a 2D EXR image out of a 3D application, you get RGBA data for every single pixel. You also get XYZ position information for each pixel’s location in 3D space. Fusion uses this deep pixel data to let you add volumetric effects to 2D rendered images. You can add things such as fog or custom lights and render it in seconds, not hours, like it would take in 3D software that uses full models with complex geometry! Atmospheric effects, like fog or mist, can dramatically increase realism in your scenes. Fusion uses GPU acceleration so you can instantly see how the effects interact with the rest of the scene, all without having to wait for renders! Volumetrics can also use world position data from deep pixel render passes so fog realistically moves both in front of and behind elements in your scene! Instead of tweaking color, brightness and other image processing operations in a 3D application, you can use Fusion to accelerate your workflow! A single EXR file can contain the diffuse pass, specular pass, normals, world position and more. Each of these can branch off in Fusion’s node tree, allowing you to quickly apply filters and effects, without having to spend time on needless re‑renders! When you buy Fusion Studio you get unlimited licenses to install its advanced 3D, 32-bit float render engine on as many nodes as you need! You can use the built in render manager or applications like Deadline, Qube and Rush to manage your rendering. Best of all, you don’t have to pay per-node render licensing like other software!